My editor at Seeking Alpha, also (by some miracle) is the editor for the Jim Cramer content for the website. Lucky her... what a combo to deal with. She emailed me about a Jim Cramer clip last night on Mad Money and my thoughts on it - you can see the clip below. Essentially it says less jobs = more profits = good for corporate America. My retort? Jim Cramer is right! We've been saying the same thing for a long time. One must realize the "stock market" is heavily skewed to larger companies; many now multinationals. I heard yesterday 470 of 500 S&P 500 companies have a presence in China. That is different than the nail salon around the corner, or the 9 person accounting firm 4 streets away. Small companies have created the majority of private sector jobs as the larger companies punt many of theirs overseas. But who cares about small business as their lobbyists are weaklings compared to those kings of capital at the large multinationals. I've often posted this cartoon in our monthly labor jobs report postings.... it is not tongue in cheek. 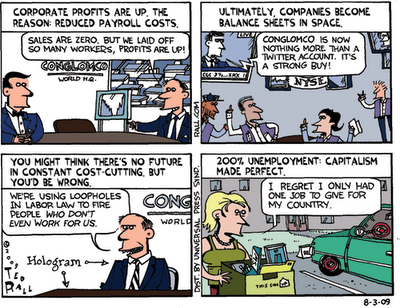 In the utopia of corporate America there would be no workers... unless they were C-level executives. Of course these executives are far smarter than the ones of the 1970s... so instead of being paid 30-40x as much as the average peasant, they must be compensated 300-400x as much. Because they've just become that much smarter (adapt at moving jobs overseas) in the past 40 years. [Oct 30, 2007: You're Fired! Now Here is $160M to Help Ease the Pain] [Sep 27, 2008: Heads We Win, Tails We Win] [Oct 4, 2008: Credit Crisis Sharpens Anger Over CEO Pay] And if you argue that point, you are a socialist, or worst... "European". You are told the "free market" is setting wages, when a small cabal of board members (many C-level executives at other corporations) engage in "you scratch my back, I scratch yours" compensation setting. Just imagine if your wages were set by peers in the industry - i.e. the IT guys at the company down the street set your wages, and you set theirs. Do you think your boss would go for that? Hardly - but that's the system for the head honchos. That's the equivalent of the"free market" in C-level compensation in corporate America. Oh yes - if you don't like it, start a proxy war... something that even Carl Icahn with his multi millions has troubles waging. (Carl by the way calls the corporate "scratch my back" system a complete dysfunction) But I digress. Where Cramer differs from myself is he believes (apparently) the government can make up for the job loss with... (drum roll) more government jobs. (oh but just until the private sector can recover of course) Which is the ultimate kick the can solution. Who knew... Jim Cramer: European Socialist? (tongue in cheek) People don't seem to understand our government is broke. It is only creating jobs by borrowing on one credit card to pay for the other. We've had zero net creation the past decade in America - despite strong population growth. 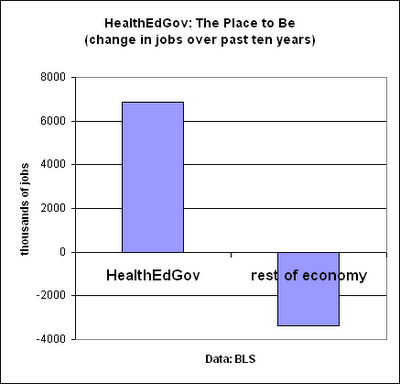 What job growth there has been has all been centered in the public and pseudo public (education, healthcare) sectors for one simple reason. They can be run at a loss since government is either the entire or large source of funding. The private sector cannot be run like that, certainly not for decade upon decade. So despite the best efforts of small business, the loss of jobs through the multinationals overseas has only just been offset by a massive influx of government and pseudo government jobs. Returning to the private sector, Henry Ford introduced wages in a long ago period so that the people who made his product could afford it. We are moving in the complete opposite way now. But you ask "how can this continue!?" "eventually these corporations will see that people in America cannot even afford to buy their own products!" Well I introduce you to the basic Ponzi scheme economy we continuously harp on. When less and less of the American populace can afford to buy things, first the homeowners are offered the house ATM. Then when that implodes we are in the current era of the government ATM. Where millions are on almost permanent government assistance (extension, after extension, after extension) and even the average Joe (who is working) now gets 1 of 6 dollars of his/her income from government handout. [Jun 5, 2009: 1 in 6 Dollars of Income Now Via Government; Highest Since 1929] [Jul 30, 2009: Cash for Clunkers a Bit Hit, Government Asks "What Can we Buy You Next?"] That can continue for a long time - as long as our creditors are happy to look the other way; the largest of which is providing the goods and has many of the newly formed jobs that were once here. It's a grand economic experiment. Multinational corporate America can have a golden age. Labor will be squeezed in the race to the bottom [Sep 4, 2009: Job Seekers Across America Willing to Take Substantial Pay Cuts] , and desperate governments can borrow to make up the shortfall (and win elections by kicking the can down the road!). Meanwhile, the central bank willingly tries to inflate assets to also help create "wealth" - so that rather than prosperity from wages, we can have prosperity from inflated stocks or housing prices. (ironically we need DEFLATION not INFLATION to combat the global forces washing at our shores) This is the path we've been on for many years, and like a drug addict each "hit" is having less effect. But they will keep playing the game until ... it ends. In Cramer's world, to combat this I suppose we just have a country with 80% government or pseudo government (education, healthcare) workers. [Aug 14, 2009: No New Normal Say Some Economists, Prosperity Without Jobs?] I guess that will be the new American exceptionalism.